Just married? Asia is one big heaven for newlyweds as it boasts some of the best beaches in the world. If you’re looking for a city that both offers a tradition-rich aura and modern feel, Kuala Lumpur is the place to go. Located in the heart of Malaysia, Kuala Lumpur is famous for its towering infrastructures and expanding skyline, but somewhere in the city lies a few getaways perfect for honeymooners. Take note of these destinations if you’re about to book a romantic hotel in Kuala Lumpur or you want to find the best place to go with your special someone. Mandara Spa Is there anything better than having some quiet time with your spouse after the big day? Nothing beats the feeling of being pampered with an aromatherapy massage at the Mandara Spa in one of the romantic hotels in Kuala Lumpur. The couple escapade package, which comes with almost an hour massage session, two-day and one-night accommodation, and buffet breakfast is specially created for lovebirds like you. Troika Sky Dining Just looking at the entire beauty of Kuala Lumpur will give you a once-in-a-lifetime experience. Your trip will be more memorable as you both try sky dining. Enjoying the stunning view of the city while you share great food will make your honeymoon more special. There’s no wondering why it’s dubbed as one of the perfect locations for romantic dining. Heli Lounge Bar Ever wondered what it’s like to view the sunset while you’re at the helipad? There is nothing like this kind of moment as you can peacefully observe the city while spending your precious hours with your spouse. Just buy a drink to access the helipad and you’re good to go. Café Café A French restaurant situated in Jalan Maharajalela, this place is your go-to place especially if both of you simply love to eat and try new dishes. This hangout offers not just good food but also a peaceful environment that invites good vibes. Try their signature dish, the best foie gras. The fine dining experience is already romantic in itself. La Risata If you feel like indulging over pasta and lamb shank, this Italian restaurant in Persiaran Ampang is a must-visit. Your sweetheart will fall in love with the food, like the hearty cream of mushroom soup and Spaghetti La Risata. Your bike will need a regular care if you want a smoother ride and for your bike to last longer. A bicycle care kit, which normally contains different bottles of oils for bike maintenance, could ensure that your bike works in the right way. A cyclist watch is not the same as any other watch, as it functions differently. With a cyclist watch, you’ll be able to find out about elevation change during your ride and predict the weather. Cycling comes at its own risks, so it’s a smart move if you carry a first aid kit during your ride. The kit is compact and easy to carry around. It contains useful items that could help stop your bleeding, patch up areas of your skin, or ease the pain caused by an accident when cycling. It never hurts to have an extra set of bike lock. For added protection, get ones with a word combination instead of a key or a series of numbers combination. It’s harder to steal a bike with a word-combination lock. If your bike has no basket, you could wear a cycling bag at the front for safety. Some bags are also designed to be attached to the handlebar for extra comfort. Bike racks would keep your bike safe and make your garage appear tidier. These days, they even come in unique designs and various eye-popping colours. For more variety of designs and colours, shop for gorgeous bike racks online, as brick-and-mortar stores usually carry the standard stainless steel racks only. With a smartphone bike mount, you can easily navigate your ride using your smartphone without having to stop somewhere. Detachable bike light truly comes in handy, especially during night time. A bike pump is a must-have for all cyclists. Get the portable one so you can use it in case your tires flatten during your ride. As a cyclist, you should be comfortable during cycling sessions to be able to reach your destination safely. These spin-worthy items can be purchased at most specialty bike shops and sports stores. You can also buy them online for greater deals. Not only is cycling great for working out, it’s also a fun thing to do during your leisure time, whether with your loved ones or by your self. One of the main reasons Kota Kinabalu is a favorite destination among travelers is its food culture. The city has a diverse selection of restaurants that offer both local and international delicacies. Hopping from one food stall to another in the city is in itself an adventure. To get the most out of your adventure, below are some of the places and restaurants that you should visit if you truly want to experience the city’s burgeoning food scene. 1) Tanjung Aru – This is a stretch of beach along the West Coast. Lining the beach are numerous food stalls, cafes, and restaurants selling everything from Malaysian street food to international cuisine like Chinese noodles. There is a popular section at the beach called the hawker court where you can gorge on seafood snacks, grilled chicken wings, and satay (the Malaysian version of skewered and grilled meat). 2) Hua Hing Seafood Restaurant – If you are craving for seafood fare, this is the perfect place to visit. It offers a selection of Malaysian, Chinese, and Thai dishes. Their main ingredients for a lot of the dishes include crab, fish, squid, and shark fins. You should try their delicious Hokkien Mee. 3) Chilli Vanilla – If you want a taste of European and Mediterranean-inspired dishes, you will surely get your fill in this cafe. Their menu includes salads, spicy duck tortillas, chicken roulade, and bakony grilled fish. 4) El Centro – A favorite among eaters and drinkers, El Centro is a cozy establishment offering a nice selection of salads, fries, pizza, tacos, sausages, and mash. And if you want to top off your meal with a nice drink, you can choose from their list of beer, wine, cocktails, margaritas, and martinis. It’s also a great place to meet new people since the atmosphere is very homely and friendly. 5) Little Italy – Are you craving for Italian food? Then Little Italy is for you. Just a short walk away from Suriah Sabah, Little Italy has the best pizza and spaghetti in town. They also serve appetizers, soups, salads, and Italian bread. 6) Kedai Kopi Yee Fung – A favorite dining place among locals, this cafe is well-known for its curry laksa. This is a delicacy featuring thin noodles, flavored soup, boiled prawns, and shredded chicken meat. Don’t miss these places if you are in town. They serve some of the best dishes and delicacies in the city. For easier access to these restaurants, you should book a hotel in Kota Kinabalu that’s near the city center. Some of these restaurants are within walking distance as long as you are booked within the city center. Before achieving tourism prominence in Malaysia, Ipoh was a popular mining town in the early 1930s. Today, Ipoh is home to gorgeous limestone caves, exquisite hotels, and top class attractions. Here are 5 stunning places in Ipoh you must visit before you die. The name of the best resort in Ipoh is most probably inspired by its surreal surroundings of a picturesque lake and magnificent limestone hills. Perfect for a honeymoon, you’ll never imagine a resort like this actually exists in Malaysia! And if you choose to stay here, you must try the Cuisine Restaurant which serves up super delicious and MSG-free food for your healthy palate. One of the most majestic caves in Malaysia, Gua Tempurung is 25km away from Ipoh and it is advisable to have your own private transport or be part of a tour group. Hiking up to the open top of the cave would take a little effort so it’s best to bring a bottle of water with you and some light clothing. If you’re worried about the heat, you’ll be glad to know it gets a little cooler in the caves. Kek Lok Tong Cave is another cave-temple you must visit that is just 20 minutes drive from the town center. Walking into the entrance of this visitor friendly cave, you will be greeted by the statues of Chinese deities before reaching the other end of the cave, which is simply breathtaking. Once there, take a moment to admire the picture perfect lake surrounded by 360 degrees of limestone hills. Just next to the Haven lies a hot spring spa resort which has its own geothermal hot spring facility and 3 caves for you to explore, all of which has its own theme such as the meditation cave, crystal cave, and steam cave. The resort is set in a valley whereby it is surrounded by lush greenery, limestone hills and in the middle, a tranquil lake to make it seem like the getaway paradise you’ve been longing for. Last but not least on the list is a theme park in Ipoh with 6 different areas of fun catered to the needs of your family. From a water park with Malaysia’s biggest wave pool to a petting zoo for the children, if you are looking for a day of fun, adventure and a night of relaxation, The Lost World provides all that. When night comes, the theme park turns into a massive jacuzzi spa, with a large selection of pools filled with natural mineral hot spring water. You’ll definitely be pampered after a whole day of crazy fun! Ipoh is really one of the lesser known places in Malaysia. But it hides Majestic places that could take your breath away, and should appear on your to-visit list. If you are planning to reach Ipoh by train from Kuala Lumpur, it would take a 2-hour journey to reach. To check for train schedules, the ETS timetable is available online. Kuala Lumpur is a very tourist-friendly city, but that doesn’t mean you should come unprepared. Other than the usual must-haves like clothes and passport, couples and families alike must pack their luggage to suit the unique environment of Kuala Lumpur. 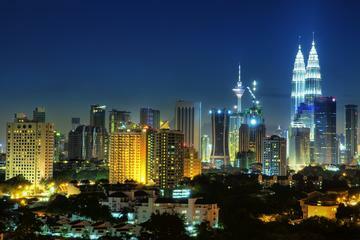 Here are the top 6 things you need before that Kuala Lumpur trip. Umbrella/Cap Bring an umbrella or a cap to keep your head protected from the sun. You might think that the tan would be great – but it can be incredibly harsh – especially for the skin of little kids. The umbrella will also come in handy for those rare instances of rain in the city. Strong Sunscreen Bring very strong sunscreen – the strongest one you can find! Make sure to lather yourself with the lotion before actually landing in Kuala Lumpur since the heat wave might surprise you. Make sure the kids get routine sunscreen to prevent sunburns. Light and Breathable Clothes Forget the thick clothes – you need light and breathable ones that will promote air circulation throughout your body. It’s better to opt for clothes that you can ‘layer’ so that you can adjust for the changing temperature from morning to nighttime. Antibiotics You might also want to bring strong antibiotics in Kuala Lumpur – just in case. Due to the exotic surroundings, routine or basic cuts and wounds can worsen overnight. Make sure that you’ve got strong antibiotics with you if you suffer any sort of cut. Ask your doctor first to find out what antibiotics are best. If you have any other medical condition – make sure you bring prescriptions with you, just in case. For example, those who suffer from asthma will want to bring an inhaler as humid air can increase the risk of an attack. Medications for diarrhea are also a must. Although the drinking water in Kuala Lumpur is considered safe, many travelers suffer from bowel problems regardless of where they happen to go. Having drugs for diarrhea is just an additional safety precaution for the trip. Kuala Lumpur Currency Although your credit card would still be of great use here, it’s crucial to have a little bit of Kuala Lumpur currency in your pocket even before you take the plane towards the country. Have some of your money converted and try to familiarize yourself with the usual prices attached to certain services or products in KL. Plug Converter Malaysia uses a 3-pin male plug so you might want to bring a converter with you. This converter will allow you to attach your 2-plug gadgets to their power source for charging, web surfing, and other electrical needs. The power supply in Malaysia is stable for the most part but if you’re using sensitive equipment, it’s better to have a surge suppressor with you. Of course, those are just some of the must-haves you need before your travel. Don’t worry, though – if you ever find yourself needing something, a good hotel in Kuala Lumpur should be able to provide it for you. Top hotels in the city are specially equipped to service international tourists so that they can fully enjoy their stay. Unless you were born and bred in Kuala Lumpur or thoroughly plied its sprawling network of public transport and walked its streets quite a bit, it’s highly unlikely that you would have seen all of its sights or heard all of its sounds. As a visitor or business traveller faced with all the promise of spectacle and experience offered by the incredible city of Kuala Lumpur, how does one decide which place to see? If you’re visiting on business or for work, choosing a destination becomes even harder if you’re strapped for time. Two of the least-known sights has to be along Jalan Raja Bot, often overlooked by locals and tourists as it is sandwiched between the more popular Jalan Chow Kit night market and Kampung Baru night stalls. This tiny strip of night market starts around 10pm and lasts all the way to early morning – you can get uncommon jungle produce from here such as snails, pisang tanduk (tusk-shaped and -sized bananas), and Asian avocados. It’s where the big restaurants in KL also get their fresh meat and vegetables before the business day. If you’re visiting Jln Raja Bot in the day, then be sure to stop by the Tatt Khalsa Diwan Gurdwara, the largest Sikh temple in Southeast Asia first built in 1922. If you’re free on Sunday, the temple gives out free vegetarian food to all lunchtime visitors. If you’re hungry and keen on one of the best and hidden nasi lemak spots in town, then why not try Nasi Lemak Menangis (it’s so good it makes you cry) at Taman CT, just behind Kampung Baru National School? Forget Nasi Lemak Antarabangsa, this one’s the real deal, and there’s a regular busking band to entertain you all the way past midnight. If you like food, take your business partners to the Kun Yam Thong Buddhist temple at Jalan Ampang (by the main road, 100 metres from the Malaysian Chinese Association building), where you can try out literally more than a hundred different vegetarian dishes and desserts – at street food prices. Staying at a business hotel right in the city centre? You’d be surprised at the good cost value of five-star hotels when looking to reserve a Kuala Lumpur accommodation. The Sunway Putra Hotel, for example, is near the Putra World Trade Centre and costs a fraction of market prices. From there, if you’re looking for a spot to wind down and get away from the bustle of it all, pay a visit to the Perdana Botanical Garden (from Pasar Seni LRT or KL train station, walk towards National Mosque and watch for signboards). It isn’t a new place but since its ongoing refurbishment from 2012 onwards, the rehabilitated garden features some of the best wildlife scenery you can find in the city. It’s quite surreal to be looking at deer at a waterfall while being surrounded by skyscrapers! And there you have it! Even if you’re not willing to travel beyond the confines of the Kuala Lumpur City Centre or your business hotel, and can only go out after hours, there’s still plenty to see. All within 15 minutes’ from a nearby train/light rail station. Choosing and buying a bike is an exciting experience. There are a lot of factors to consider such as budget, right bike size, how often the riding trips will be, the purpose of these rides, and whether the rides will be on rough roads or pavements. However, the combination of these factors will give you seemingly endless choices that could easily be overwhelming. For beginners, the first thing to know is the different types of bikes and what kind of road they are best for. The mountain bike is made for rough terrains and gravel roads. It has a shock-absorbing suspension that is best for unpredictable off-trail rides. The knobby tires and the strong brakes also give the cyclists a much better control of the bike compared to other types. For urban bikers that want to navigate the concrete jungle, the road bike might be the best choice. Road bikes have thinner tires than the mountain bike and have much lighter frames, which makes them perfect for road racing. Road bikes also have curved and dropping handlebars, which puts the rider in a bent-over position that is suited to increase the speed. They hybrid and commuter bikes have features that came from the mountain bike, and other feature that is inspired by the road bike. These two types of bikes have moderately thick tires that are perfect for pavements or smooth roads. The rider is also positioned upright for a more relaxed riding. Most models can also be fitted with accessories to help you transport items to your destination. There is a rising trend in the popularity of folding bikes in eastern countries. The folding bike is best known for its compact design with smaller wheels. Much like hybrids, these bikes are also great for both smooth and rough roads. For those who want to buy a folding bike in Malaysia, there are other factors that should be considered such as affordability, weight, the length of travel, and even style. Before purchasing a bike, make sure that it fits you perfectly. Ask the store for help in finding the right frame for your size and try to go for a test ride. It is important that you are comfortable in riding the bike and that it caters to your riding activities, may it be off-road biking or urban commuting.